New video footage has been released by TEPCO (Tokyo Electric Power Co) of the moment the devastating Japan tsunami hit the Fukushima nuclear power plant. 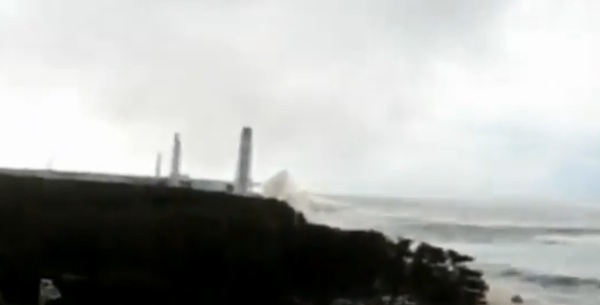 The brief video shows the massive wave crashing over the Fukushima Daiichi power plant’s seawall and swamping the site. The sea spray from the giant wave can be seen rising well above the buildings housing the nuclear reactors. TEPCO has said the water reached 14 to 15 meters, or 45 to 48 feet, above usual sea level. This was easily high enough to breach the nuclear plant’s 5 meter seawall. The footage was taken from nearly a kilometer south of the Fukushima plant by a worker who evacuated before the tsunami hit the coast. Two workers were killed in the basement of the number 4 reactor’s turbine plant when the tsunami hit. Their bodies were only recovered last week. The massive tsunami damaged power generators and pumps necessary for cooling the nuclear plant’s reactors. The nuclear crisis following the earthquake and tsunami has largely been due to the difficulty in preventing the reactors from overheating and melting-down. Plant workers have now begun to lay pipes between the nuclear reactors and the radioactive waste treatment area. It is hoped that radioactive water that has been building up can be pumped to the treatment facility. Hundreds of tons of water a day has been poured into the reactors in an effort to cool them down. Radioactive water from the plant has been pouring into the Pacific Ocean. I fail to see how that is in any way homosexual. Next post: Clean Energy Economy: Path To Prosperity Or Economy Destroyer? Previous post: Should you ban bamboo?